In the journal level calculations each journal has equal weight; in the article level calculations the impact factors for the journals are weighted by their publication volumes. 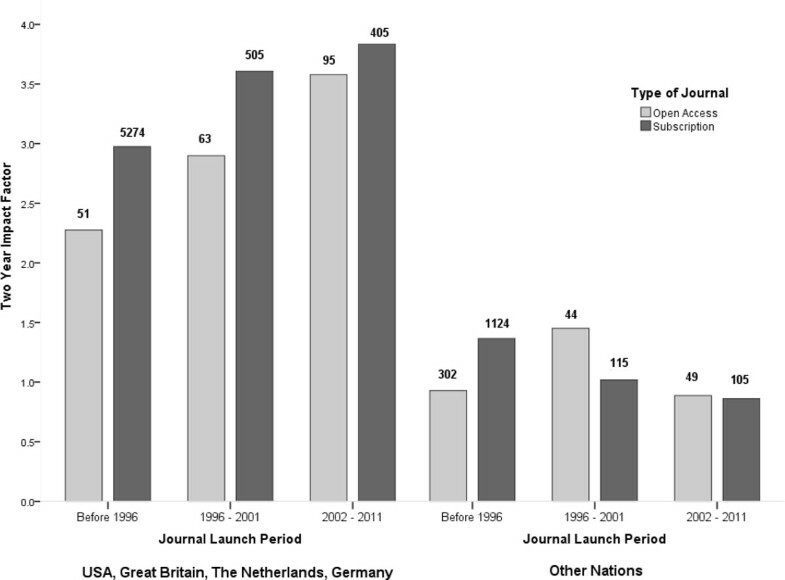 Citation averages as a function of the journal start year for two regions. The figures are based on Web of Science and weighted by journal article volumes. 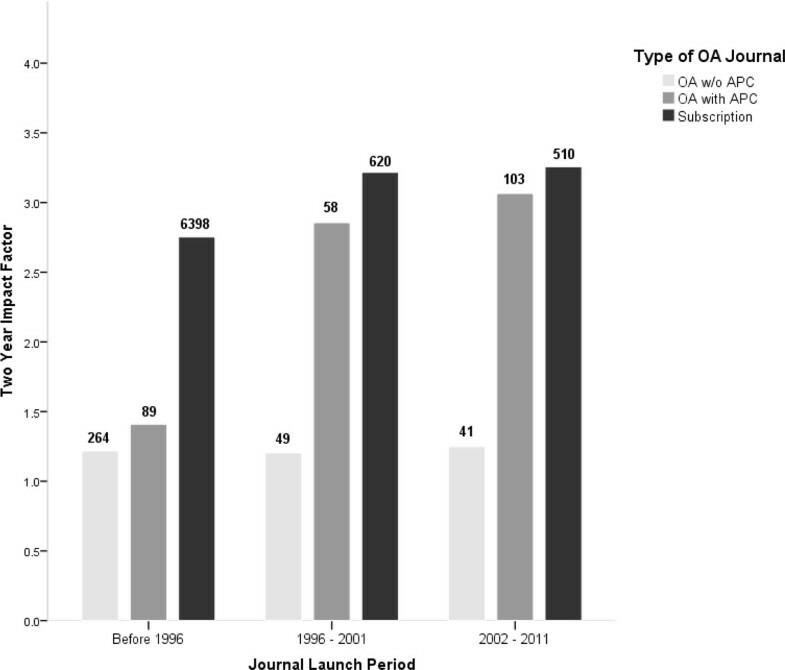 Several studies have shown that gold open access journals have had a larger uptake in the biomedical fields [1, 15], where authors usually have less problems in financing APCs and where many research funders also require some form of OA for the results. Figure 2 shows the average JCR impact factor of OA and subscription journals weighted by the number of articles as a function of the discipline. The journals were split into two groups. The first included journals with the Ulrichsweb discipline category 'Medicine and Health'. All the other disciplines were combined into the second group. Citation averages as a function of the journal start year for Medicine and Health versus all other disciplines. 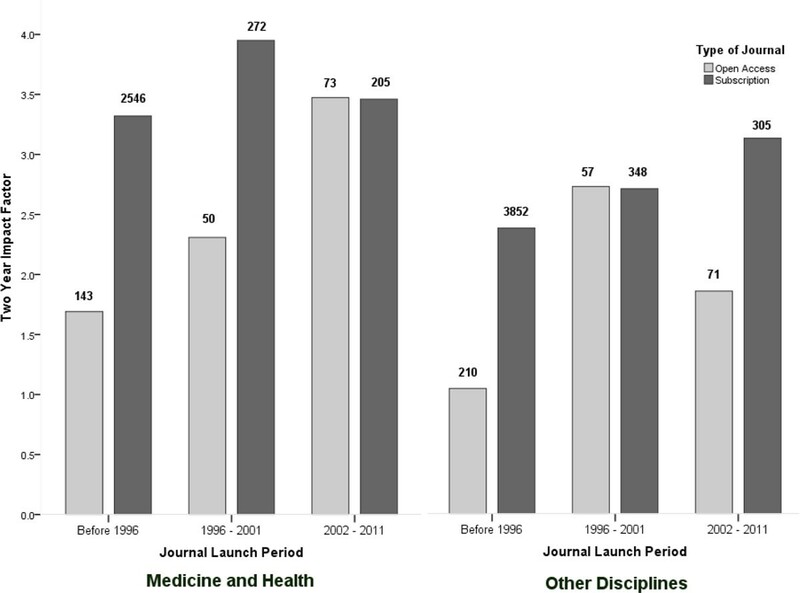 The figures are based on Web of Science and weighted by journal article volumes. Citation averages for open access journals using article processing charges (APCs) versus those that are free to publish in for authors, compared to impact factors for subscription journals.